CONSULTANCY APPROACH: As part of SDI’s consulting approach, we analyzed the issues and limitations from which Stage Stores suffered– ranging from limited manual processing capacity to lack of space within the DC– and provided a solution that tackled those problems and increased accuracy. AUTOMATED SOLUTION: Implemented Joey Pouch Sorter. ENHANCED OPERATION: The solution increased space efficiency, accuracy, speed, and overall operational productivity. Stage Stores fulfilled E-Commerce orders utilizing a strategy incorporating a limited number of stores as well as their Distribution Centers– one Distribution Center was designated as the primary E-Commerce fulfillment location. As their E-Commerce continued to grow, the pattern they were seeing was clear: a higher number of orders with a low number of items per order, combined with a rapid-growing SKU count. The manual fulfillment process utilized by the primary fulfillment location was not going to be able to meet the demands of the next peak season. It was clear that a new solution had to be delivered prior to peak, which was only in nine months away. Stage Stores’ small store footprints and their fast-growing E-Commerce SKU count, made things more difficult. Stage knew that adding more stores to the fulfillment strategy would increase the likelihood of generating multiple shipments to a customer and increase the shipping cost. They also knew that maintaining the operation centralized posed numerous challenges of its own. In addition to all of this, Stage was beginning to suffer from a limited footprint in their DC. With only manual Put Wall systems present, no physical space to expand, and a limited timeline; Stage Stores needed an innovative solution that would allow them to stay their course and fulfill E-Commerce orders from their DC. 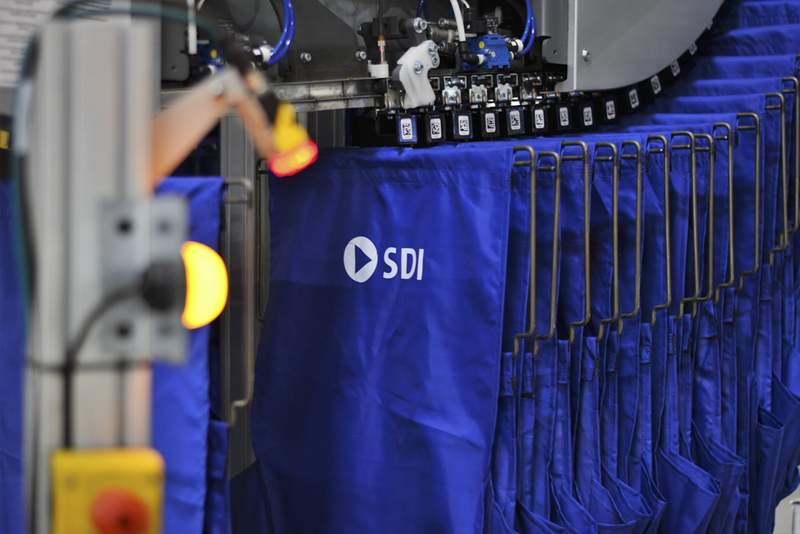 SDI provided Stage Stores with a state-of-the-art solution that went above and beyond solving the difficulties they were facing. The Joey Pouch Sorter went into the 436,000 sq. ft. –already filled DC—only needing space for induction, which worked with the limited footprint by using space that could not be taken advantage of before. In addition to having an intuitive system that helped shorten the learning curve, the productivity has also been positively affected. A picker walks around the DC with a cart and picks items into big bins. Once the picker fills these bins, he or she will bring the items into the system by scanning each item (in any order) and putting it into a pouch. At this point, the process is fully automatic. As each item gets scanned, the item is married (linked) to the pouch in which it’s placed. One by one, each pouch whisks their item into the ceiling. Once in the air, the pouches are taken to the staging area (above a cafeteria), where via sophisticated algorithms, the system places the pouches into ordered sequence. 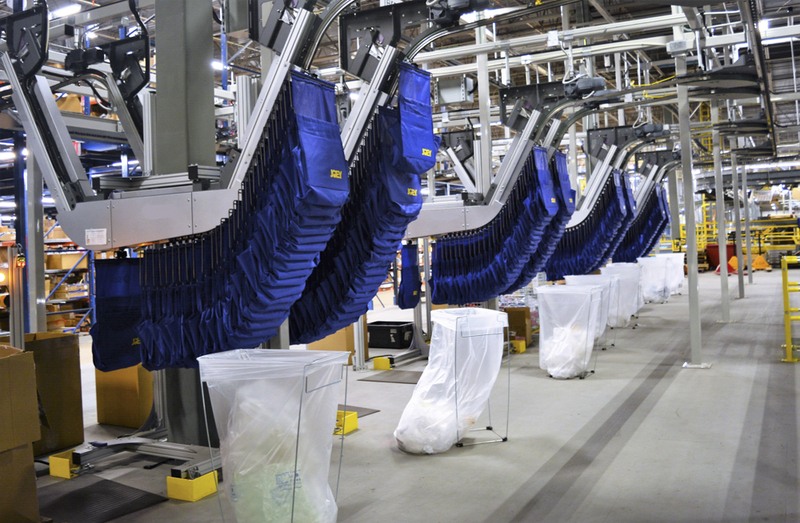 Once the pouches are assembled in ordered sequence, they circulate above until packing becomes available. As packing stations free up to receive more orders, the system releases the pouches in ordered sequence out to them. 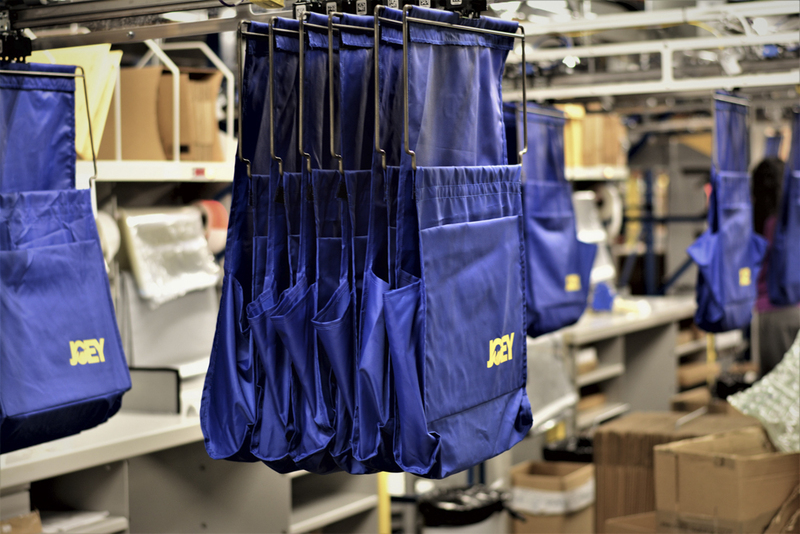 At Stage Stores, there are different types of pack stations that can handle different order volumes, so the system preemptively takes into account how much the volume for each order will be and sends it to the corresponding packing station. The items are either packed automatically or by a person at a packing station and then shipped. Stage Stores Inc. brings moderately priced, nationally- recognized brand name and private label apparel accessories, cosmetics and footwear for the entire family across 40 states. Stage Stores operates approximately 797 stores under the “Bealls,” “Palais Royal,” “Peebles,” “Goody’s,” and “Stage,” trade names and they are supported by three Distribution Centers.